The Barn, at first glance, seems like nothing more than a ramshackle, old shack. It is unfathomable to think that countless artists — some famous, some not — have performed inside, ranging from Nobel Laureate Bob Dylan in the ‘50s, to comedians, musicians and spoken word artists. 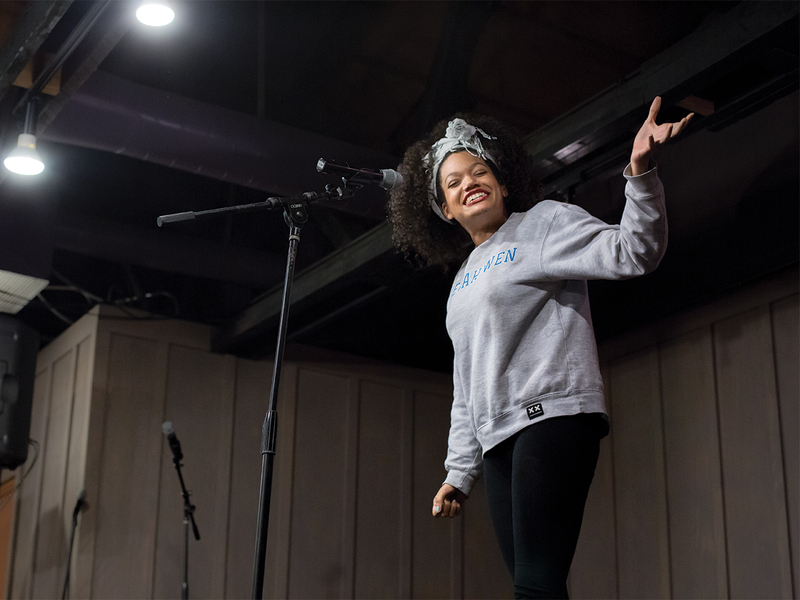 On Tuesday, Oct. 18, three of the nation’s premier spoken word artists performed their work in The Barn at the Associated Student’s Programs Board’s (ASPB) “More Than Spoken Word,” even further sacralizing the historic venue. At 7 p.m. a mass of students lined up, and shuffled in, many amongst groups of friends, others by themselves. Before the event started, one could sense the expectation in the air: Many individuals had come to see a favorite poet. “More Than Spoken Word” boasted a lineup of three different performances: An opening act consisting of Mila Cuda and Jessica Romoff, then went on to G Yamazawa, before ending with noted artist Alysia Harris. The event began with an open-mic portion, where students were allowed to read their work and perform some of their poems. At first, there was hesitation — with the audience members gauging what kind of space this might be, or perhaps some potential readers gathering up the courage to step onto the stage and read. However, once the initial hesitation dissipated, students began reading their own poems, some of which were political or personal, many of them dealing with loss and heartbreak. Cuda and Romoff went back and forth, performing single poems dealing with a range of issues, from feminism and the female body, to politics and race relations. For relatively young performers, the stage presence and confidence resonated with the entire audience. 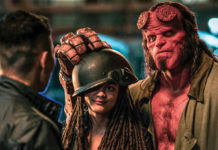 Throughout their performances, members of the audience would clap, snap their fingers or even yell out, “Yes!” The duo performed a particularly powerful poem titled, “Exes” together, in which they highlighted different forms of domestic abuse and harassment that teenage girls face. 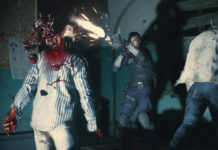 This performance consisted of Cuda and Romoff standing back to back, holding a conversation as boyfriend and girlfriend — the dialogue moves between them talking to each other, over each other, yelling, screaming and threatening self-harm. By exposing the overall coercive nature of such relationships, Cuda and Romoff shed light on the reality of harassment which many teenage girls face throughout the country. Then G Yamazawa took the stage. 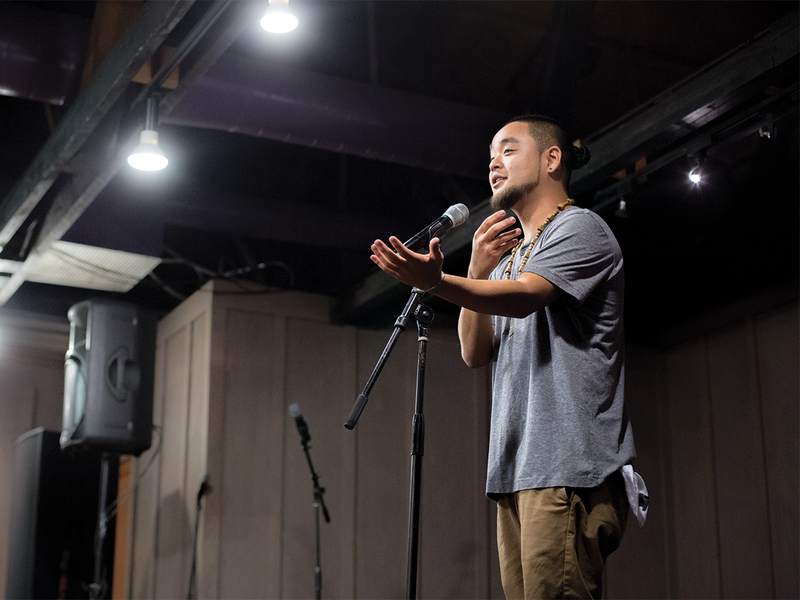 Yamazawa, a Japanese-American poet hailing from North Carolina, is an award-winning international spoken word performer, and the level of his craft definitely showed through his performance — his performance was flat out stunning. Yamazawa was by turns funny, clever, moving, thoughtful and remarkably intelligent. As soon as he graced the stage, he began introducing himself, his name and smoothly segued into his opening performance; I still can’t exactly figure out when he stopped speaking and started performing. He opened with a meditation on growing up Japanese in North Carolina, titled, “10 Things You Should Know About Being Asian in the South.” Dealing with issues of belonging and racism, Yamazawa delivered. Throughout his entire set, Yamazawa would engage the audience, joking about the South and his different experiences there. While Yamazawa touched on a wide variety of subjects, the central theme his poems returned to was of home and belonging. He performed a poem which celebrated the life his grandmother lived as an immigrant in Japan, and which would further explore how his inability to speak Japanese might break the link between his children and his grandmother. Furthermore, as Yamazawa was finishing up his set, he gave a shout out to the next performer Alysia Harris, claiming that, “Harris is one of the great performers of my generation.” This remark resonated with the audience, who immediately began cheering, indicating that many were already familiar with her work. Harris’ performance touched on ideas of alienation, heartbreak and racism. In one poem she talked about the lives of all the women in her family, her mother and grandmothers and aunts, in order to maintain and keep alive their struggles. By far, the most moving poem she performed was titled, “Death Poem,” which explored death and love: “My love, please don’t be afraid / But there will come a day / When field mice play in our empty sockets.” Through this poem, she explored mortality and human relationships. ASPB’s magnificent “More Than Spoken Word” gave world-class poets an opportunity to share and inspire countless students. While many students eagerly anticipate larger events such as Spring Splash or Winter SOULstice, one can only hope that ASPB decides to host another carefully curated spoken word event such as this.